The use of antimicrobial agents and vaccines has been very successful in reducing the morbidity and mortality associated with many infectious diseases. However, especially for the growing number of patients with compromised host defense mechanisms, infections remain a serious and increasing problem. The normal relationship between host and microorganism appears to be finely balanced, since the microorganisms can easily take advantage of any disequilibrium, such as alteration of the bacterial flora or impairment of the host defense system. 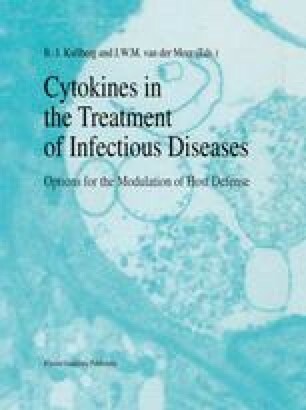 It is therefore desirable to focus on the modulation of host defense mechanisms in addition to antimicrobial therapy, in order to restore the equilibrium between the host and the invading agents in these patients. Only recently a new range of agents has become available that are capable of stimulating and regulating host defense systems. Interleukins, interferons, and hematopoietic growth factors are now being produced by biotechnology industry and are being evaluated for clinical use in this area.